Special Order Melodies for Musical Movements. 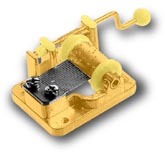 Many tunes for Musical Movements or Music Box Movements that we do not stock can be SPECIALLY ORDERED from the Factory. Choose from Standard 18-Note Wind Up Musical Movements or Hand Crank Musical Movements. Click on choices below for more information.